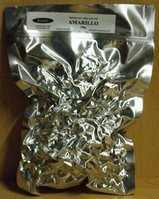 Amarillo hop for use in home brewed all grain beers - Vacuum packed for longer shelf life. An American hop noted for its citrus/grapefruit like aroma, which is similar to that of Cascade hops, and its strong bittering qualities. It is often used as a substitute for Cascade and Centennial hops. Its typical alpha acid levels are 6.5-9.0% depending on the harvest, so you may need to adjust the amounts used in your recipe to ensure that you match the target EBU value. It is the hop that gives its name to Crouch Vale Amarillo Ale.